1.The gold magnetic metal plate should be attached to the the magnetic cradle of your car charger used on the dashboard;the black metal plate recommend to use in office or home. 2.The thickness of phone case should less than 3mm while using the wireless car charger. Q: How much of the thickness of the phone case can be used in this car charger? A:The thickness of phone case should less than 3mm while using the wireless car charger,if excceed 3mm, the charging will be snatchy and will not even charge. Q: How the metal ring works? A:if the magnetic force is not strong due to the phone case is thick than 3mm,and it should be stick to the phone case for use. Q:Why does the LED indicator keep flashing but my phone is not charging? A:1.Please make sure your mobile phone is qi enabled phone. 2.Make sure your phone is on the right charging area. Fast Charging：Wireless charger output is 9v 1.1A/5v 1A,Charges your phone up to 1.4 times faster than standard chargers,fast charging mode is available for Samsung Galaxy S9 Plus, S9, S8 Plus, S8, S7, S7 Edge, S6 Edge Plus, Note 8. (BONUS with QC 3.0 car charger); standard charging mode is available for iPhone X, iPhone 8/8 Plus and all other Qi-enabled devices. Multiple installation options:This wireless car charger can easily installed clip on the air vent or stand on the dashboard via stick the gold metal plate with 3m sticker to the magnetic cradle. Considerate Design:You also can set any degree you feel comfortable,which it's 360° rotating.This wireless charger is available for phone case within 3mm,if the magnetic force is not strong due to the thick phone case, please stick the metal ring to the phone case which included in the package. 2-in-1 multifunction car charger and phone holder:Not only can be used on air vent or dashboard but also used at office or home wherever you like. 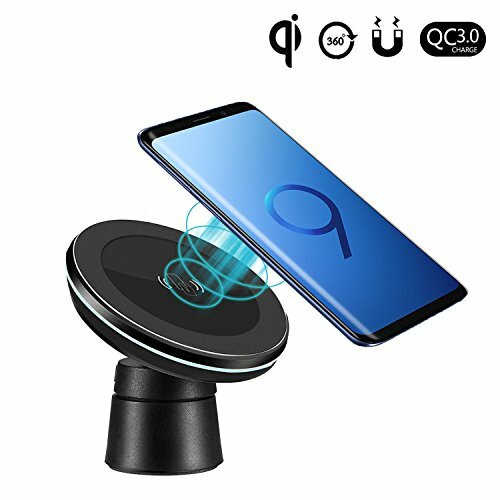 Valued package and warranty:Fast wireless charger BONUS with a QC 3.0 car charger,Metal ring*2 and metal plate*3 is to strengthen magnetism and other accessories. You also can get our 12-month warranty and friendly customer service.